Today some Thai people we met said there is a movie about Pai that has been used to bring people to Pai, tourism stunt, go figure. The movie is called Pai in Love, so there are signs everywhere promoting “love in Pai” or “love Pai” or “Pai in Love” it’s almost as big as I ❤ NY. Pai is a beautiful mountain town. Really I cannot get over how stunning the landscape is at every twist and turn. Today it was about 80 degrees with a bright blue sky. 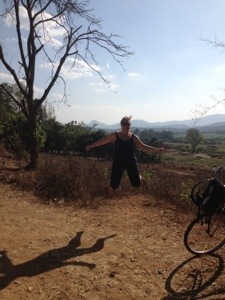 Kate and I went for a bike ride through the winding hills and found an elephant camp. We sat and watched the elephant for some time then took the road back up and down the mountainous hills, stopping to grab a photo or two along the way! Our housing in Pai is something out of a movie. We are staying in this little villa of huts along the Pai river. 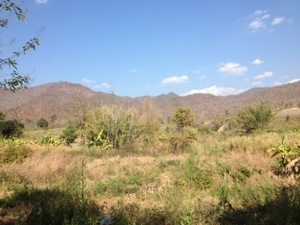 The people are very nice and we have met some travelers both Thai and foreign. This place has such a relaxing feel. I only hope the islands can compare to this exotic and eccentric village. I almost forgot to mention, there is a big walking market on the main roadway every night!